There will be a free showing of GMO OMG, a film by Jeremy Seifert, on Tuesday, October 29, 2013 at 6pm at the Richmond Masonic Center, 753 North 185th St Shoreline 98133. 6:00pm - Socialize - drinks and popcorn - 6:30pm - Movie. Discussion immediately following movie on I-522 with Senator Maralyn Chase and guests. 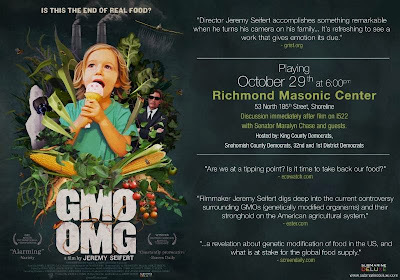 "GMO OMG Official Trailer" available to view here. The showing is sponsored by the 32nd LD Democrats, along with democratic partners - King County, Snohomish County and 1st LD Democrats.